The beauty ideal: May Favourites. I'll start off by apologising for not posting in a fair few days, I just feel like I'm having such a bad time with content and photography at the moment - it never seems to go right! Anyway, I'm coming at you today with my May Favourites. It's scary to think we're nearly into the half way mark of 2015, where has the time gone?! I'll be starting uni and moving into my own place before I know it. My first favourite of this month has been my Makeup Revolution Naked Chocolate Palette (£7.99). I've been getting some serious mileage out of this palette in recent weeks and I just love all the shades. 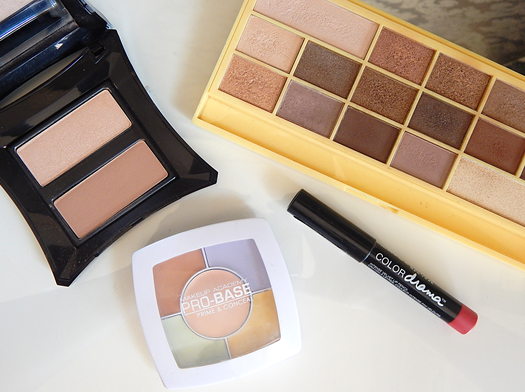 A definite must for the neutral shadow lover. Secondly has been the MUA Pro-base Prime & Conceal Quad (£4.00) - I can't believe how well this works for such a cheap price tag. A dream to use if you suffer from any sort of discolouration in your complexion - I've been loving it for concealing redness and my bruise-like dark circles. My contour fave in May has been Illamasqua's Sculpting Powder Duo in Illuminate & Nefertiti (£26.00). The contour shade works so well on pale or tanned skin and the highlight gives a lovely sheen to anywhere you wish to put it on the face. A steep price tag but completely worth it - I'm so happy I received this as a birthday gift. Lastly is Maybelline's Color Drama Lip Pencil in Light It Up (£4.99), a beautiful red that'd suit any skintone. I have so many of these lip pencils I've nearly got the whole set! They have amazing pigmentation and are a joy to wear - not uncomfortable or drying in the slightest. I've recently picked up the shade Keep It Classy and I can't wait to wear it. I've not bought many new products in May as I'm trying my best to save for when I move out, but I'm enjoying shopping my stash and getting some proper use out of all the stuff I currently own. I love that Maybelline lip pencil :) also Makeup Revolution palette look great. Nice favourites! The palette looks great!